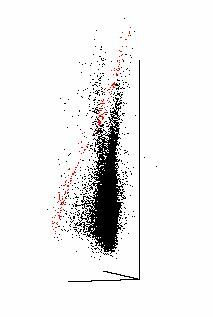 In Naylor et al (2002) we derived an age for this cluster of 20-35Myr, and determined a mass function down to 0.1 Solar masses. For the paper we created two main catalogues for this cluster. There is the table of cross identifications with Claria (1982) published as part of the original paper (Table 2), with a small correction from Francois Ochsenbein of Strasbourg (the star at 08 10 46.62 -49 17 31.53 is Claria number 55). There is a deep survey (Table 3), a shallower, but wider area survey (Table 4), and the combination of these (Table 5). Extracted from the deep catalogue are tables of members of the cluster derived using either the D'Antona & Mazzitelli (1997) isochrones (Table 6). or the Siess (2000) isochrones (Table 7). All these catalogues are in cluster format, but the members catalogues have four additional columns, described here. And, as you reach for you fibre spectrographs to make follow-up observations, we wish you the best of luck, as long as you read the warnings. The above work relied on the X-ray catalogue of Jeffries and Tolley (1998), which is given here for convenience in cluster format. NGC2547, the movie. An animated gif or mpeg file which shows V vs B-V vs V-I from the combined catalogue. Our membership selection is shown in red. We have also shown that this cluster is mass segregated (Littlefair et al 2003), based on the wide survey presented in Naylor et al (2002). To do this we created a list of members from the wide survey, which is available as Table 1. In Jeffries et al (2004) we derived a mass function down to 0.05 solar masses (. For the paper we created an RIZ catalogue (Table A1), and a catalogues of members derived from both the Baraffe et al (2002) and the D'Antona & Mazzitelli (1997) isochrones (Tables A2 and A3, respectively). The files are in cluster format, and there is also an additional set of explanatory notes. In Naylor & Jeffries (2006) we used our τ2 fitting technique to derive an isochronal distance modulus of 7.79+0.11-0.05 and an age of 38.5+3.5-6.5 Myrs. The latter is consistent with the Li depletion age. This cluster is also included in Mayne et al (2007), where we produce an empirical isochrone revealing a nominal age of ~30Myrs, this is however ill-determined due to the lack of comparison isochrones at this age and possible problems with a different photometric system. The photometry is taken from Naylor et al (2002). spectroscopic members from Jeffries and Oliveira (2005) .